A collection of the city’s historic neon signs, rescued and restored or stored and available for you to view. 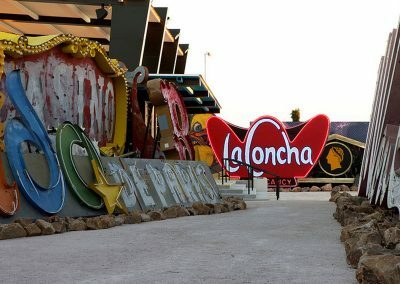 There’s a visitors’ center made out of the old, shell-shaped La Concha motel lobby, the Neon Boneyard with old signs that can be toured, a small park, and restored signs on and around the Fremont Street Experience. The restored signs are located on and around Fremont Street and the Fremont Street Experience. The permanent museum facility is located a few blocks north on Las Vegas Boulevard at McWilliams Street. 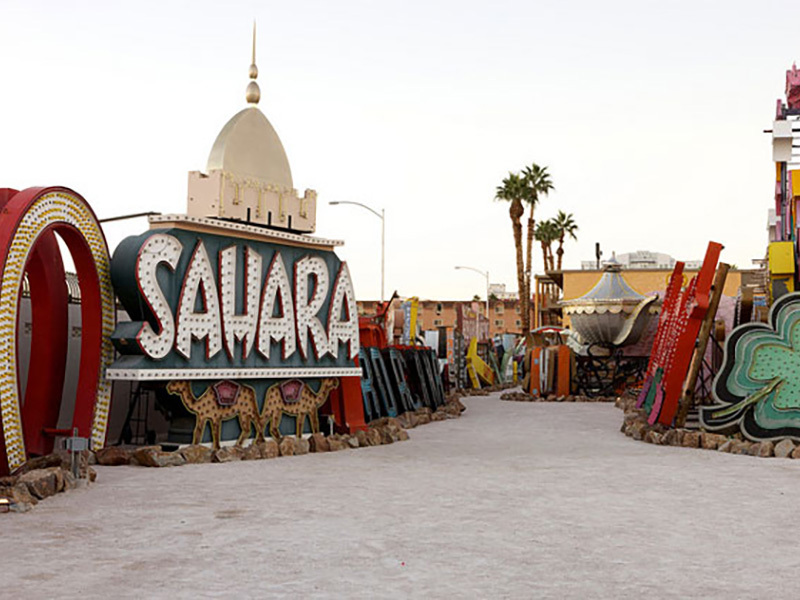 Seeing the restored signs on Fremont Street is free. Going to the museum and boneyard costs but it is worth it. Tour times vary seasonally. Be sure to buy tickets in advance through the museum’s website – tours sell out quickly and walk-ups are discouraged. It doesn’t get more iconic Vegas than this. For decades the Young Electric Sign Company (YESCO) has been creating the majority of the amazing neon artwork – yes I called it artwork – that has adorned the fronts of the hotels and casinos in Las Vegas. Actually it goes way beyond that – the neon signs on gas stations, motels, convenience stores, and just about everything else in this city have mostly been done by YESCO. But as The Strip has marched relentlessly forward toward a more sanitized, upscale, corporate image, the neon signs that adorned the fronts of the casinos have fallen by the wayside, viewed by many as tacky and antiquated. Whether they were replaced by one of those gigantic pseudo-TV screens (yeah, those aren’t tacky) as a hotel remodeled or removed just before the implosion, neon has faded on Las Vegas Boulevard. 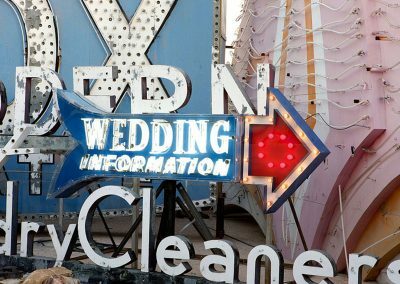 Since YESCO technically owns the signs (they are leased to the hotels), they offered refuge to many of the former glories, creating what was colloquially known as the Neon Boneyard. 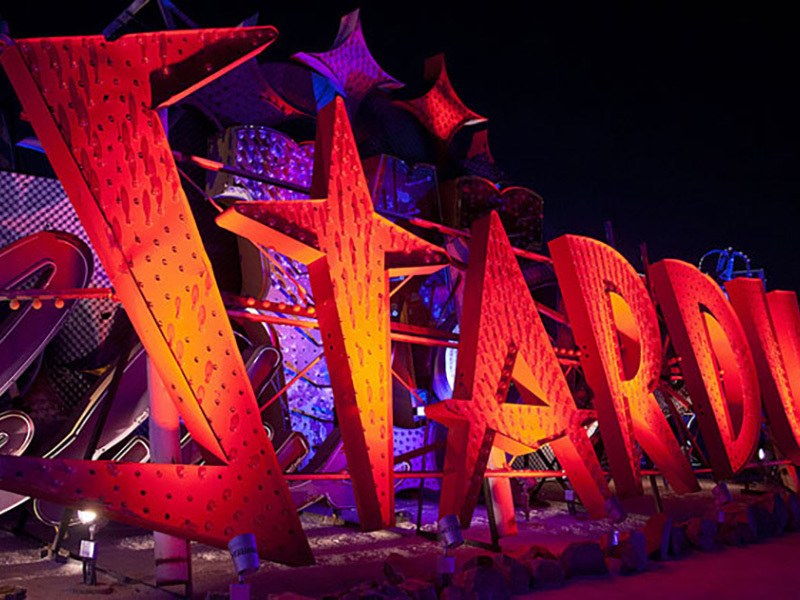 This big fenced off lot located near their main facility was where classic neon artwork was left to fade and rot in the unrelenting Nevada sun. 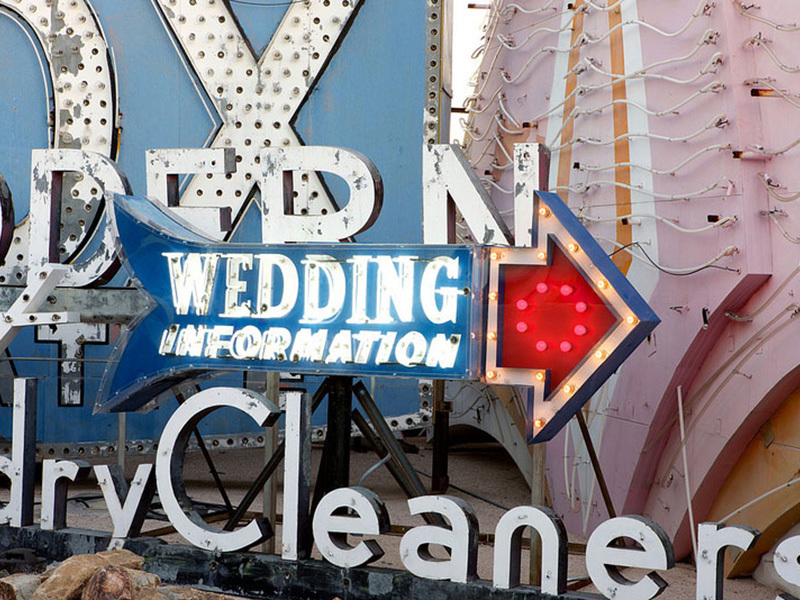 The signs represented the last bits of the colorful history that Las Vegas has swept away in the name of modernity. And there they probably would’ve stayed if it hadn’t been for the efforts of The Neon Museum, a not-for-profit organization that rescued the signs in conjunction with YESCO and set out on an ambitious project to restore them and/or preserve their unique place in Vegas’ history. For a long time the Neon Museum has consisted of a few restored signs along and adjacent to The Fremont Street Experience in Downtown Vegas plus a relocated Boneyard that offered limited tours. 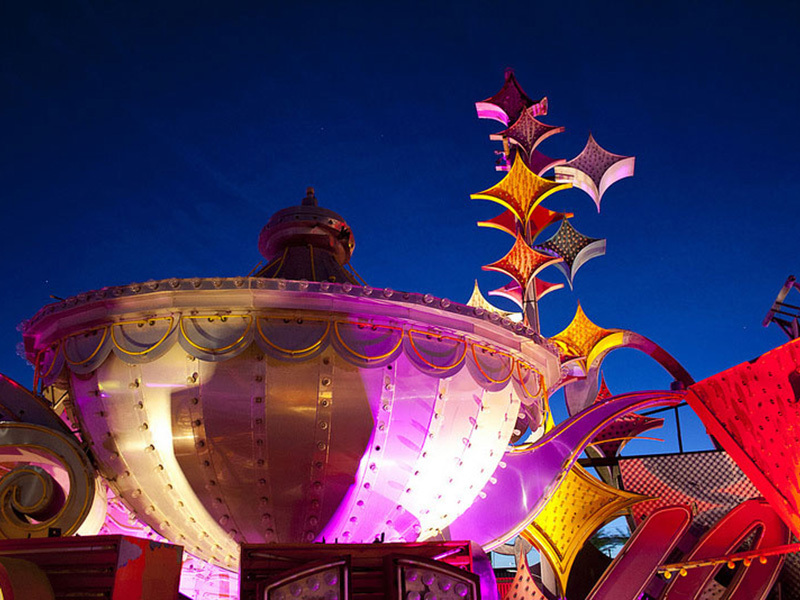 Now, a permanent, stunning facility offers an amazing glimpse into Las Vegas’ past. 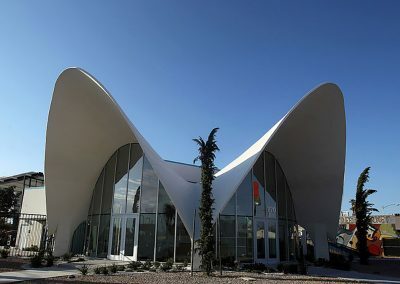 You start in the welcome center, which was once the shell-shaped lobby of the La Concha motel on the Las Vegas Strip. The mid-century wonder was cut up and transported to the museum location and then restored to act as a queuing location for the guided tours that take place in the adjacent boneyard. 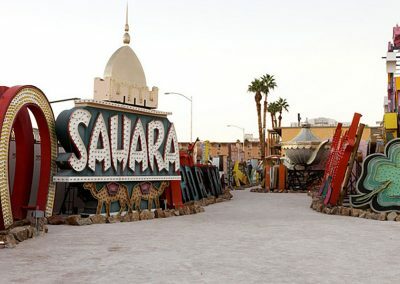 Groups of about a dozen are taken through the dusty but well-organized and laid-out lot where you’ll see and hear stories about signs from historic, and in many cases long-gone, Vegas casinos. There is an original corner piece from Golden Nugget, a massive script sign from the Moulin Rouge, a camel-adorned display from the Sahara, a massive pirate skull from Treasure Island, and dozens more. Each one comes with a story and the tour guides are not only well-informed but seem almost giddy to be sharing the history of these treasures. 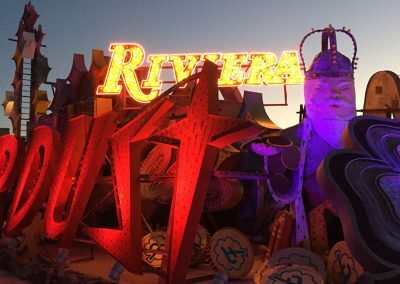 A 2018 expansion added more signs and viewing areas and a nighttime show called “Brilliant!” that projects lights and video onto the signs to make them seem as if they are coming alive. My favorite pieces were the more obscure ones. For instance, there’s a sign from a small motel that shares the name with a multi-billion dollar Strip complex: City Center. It featured a cityscape that made it appear as if lights were coming on in buildings as night fell. And I loved hearing the behind-the-scenes tales of the hotels and the signs themselves, some of which was new to even me, a big Vegas history buff. 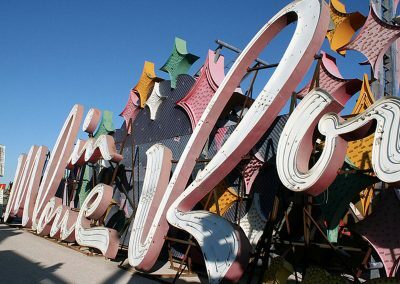 For instance, did you know that the Moulin Rouge sign was created by Betty Willis, the same person who designed the Welcome to Fabulous Las Vegas sign? The tour lasts about an hour and is absolutely worth what it will cost you to take it. A few quick notes… buying tickets in advance via their website is an absolute must. Because they limit the number of people who can be on each guided tour, they fill up quickly and so walk-ups are often turned away. The good news here is that they now offer self-guided tours, which aren’t as informative as the ones with people explaining the history of the signs but a decent fallback position if you can’t get a ticket to one of the guided tours. Also, note that the majority of the tour is outside, so pay attention to the weather forecast (hot or cold) and plan your wardrobe accordingly.